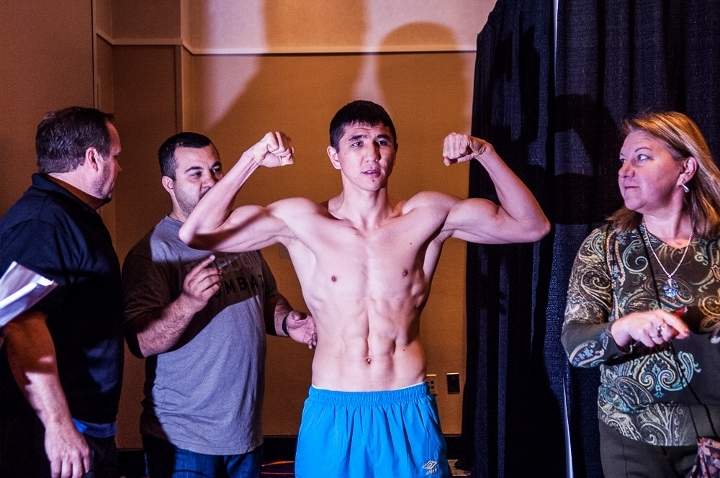 Junior middleweight prospect Madiyar Ashkeyev overcame a rough start early on to win a hard-fought unanimous decision over Luis Hernandez Friday night at the Chumash Casino Resort in Santa Ynez, California. Hernandez hurt Ashkeyev in round one, but the Kazakh-born fighter was able to hold on and recover. Ashkeyev began to outbox Hernandez behind a consistent jab, landing several combinations. Hernandez attempted to initiate exchanges, but Ashkeyev effectively countered to the head and body. As the bout progressed, Hernandez’s punch output dropped significantly. Ashkeyev stamped his win in round 10, dropping Hernandez to the canvas. Hernandez did get up and did enough to hold on until the final bell sounded. Scores were 98-91, 98-91, and 99-90 for Ashkeyev, who improves to 11-0, 6 knockouts. Hernandez, who resides in Rio Pierdas, Puerto Rico, falls to 16-7, 9 KOs. He has lost five of his last six fights, four of them to unbeaten fighters. Another Kazakh fighter also fought on the card, ending matter quickly. Hard-hitting middleweight Meiirim Nursultanov (10-0, 8 KOs) knocked out Ramon Aguinaga of Mexico in the second round. Time of the knockout was 2:50. Aguinaga (13-2, 9 KOs), who now resides in the San Diego suburb of Chula Vista, was knocked out in round five by his previous fight by unbeaten Christian Mbilli on July 27. Ashkeyev and Nursultanov are promoted by Main Events and managed by Egis Klimas. Both now live and train in nearby Oxnard. In junior lightweight action, Filipino-American John Lee Dato (9-0-1, 6 KOs) knocked out veteran Aaron Hollis (4-9, 2 KOs) at 2:03 of the fourth round. Lightweight Angel Flores improved to 4-0, 2 KOs with a second round knockout of Chris Beal, who was making his pro debut. Time of the knockout was 2:32. Junior lightweight Manuel Romero (4-5-3, 2 KOs) stopped Bacilio Monterroso (0-5) at 2:39 of the fourth round. Five amateur fights took place prior to the five pro fights that took place on ‘World Fighting Championship 98’ card.